Handle Type: Dipped Overall Length: 7, 10, 12"
There are 856 items available. Please enter a number less than or equal to 856. Immediate payment of US $71.28 is required. Very versatile an and precise. The machined hinge design is way more precise than the more common slip jaw plier that one sees in hardware stores. I'm very impressed. Also the angular section of the opposing sides of the jaws grip hex nuts like a wrench. Very excellent design. Have used these for years. Bought these to replace my lost pair. They have no pinch handles and are one hand grip. Cant beat the quality. Highly recommend. I bought my first pair over 20 years ago. I have worn out several, and they last a long time. I carry a pair or two with me always. Best tool I've owned. These are my go to slip joint plier. Narrow head doesn’t get in the way, they never slip and bust me knuckles, they are ergonomically marvelous and fit my hands as if they were built for them. Excellent buy and would do it again! 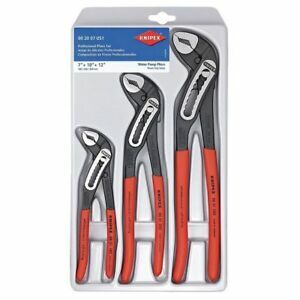 this is by far the best set of pliers money can buy. i use mine daily. i would be lost without them.